In mid-August I published a blog on Huffington Post titled "When Appreciating Works of Art, Being There Is Always Best." Composing that blog, and coming across the writings of the aesthetic theorist John Dewey, turned out to be great preparation for the visit that I made yesterday to La Jolla, where I took in some of the key works from "Phenomenal: California Light, Space, Surface." "Phenomenal," which features works that involve sensory phenomena, is an exhibition that you can't just see; you have to experience it. John Dewey's ringing endorsement of the essential value of experience -- "There is no other foundation upon which aesthetic theory and criticism can build," -- was on my mind as I walked into the late Eric Orr's powerful installation "Zero Mass." Leah Masterson, a Communications Associate of the museum, walked in with me, and together we found ourselves in total darkness. "Zero Mass," which Eric Orr (1938-1998) first created in 1969, is an oval space, defined by seamless walls of paper. Your eyes will tell you -- at first -- that there isn't a hint of light to be found, and the shock is unsettling. "The apparent emptiness in which we find ourselves," explains Dawna Sculd in the exhibition catalog, "undermines the stable sense of self that carries on unquestioned outside it." By the time Max Metzler, one of the museum's security staffers, entered the space, my night vision was beginning to work. Thomas McEvilley does a good job of explaining the physiology of this process in his 1982 article "Negative Presences in Secret Spaces: The Art of Eric Orr;"
"The transition from rod to cone vision gradually unfolds; floods of afterimage color wash over the vision and gradually decrease like waves. After about 12 minutes one is ready to see, but in a different way." Because of the gradual activation of night vision that McEvilley describes, when Max walked in to join us he appeared to me as a flat dark, featureless silhouette, with just the slightest hint of color appearing towards his feet. I also was beginning to make out a thin zone of yellowish light appearing where the paper walls touched the museum's floor. Being joined by another person in this situation -- where most of the visual clues to human identity were masked out -- was intensely dramatic and rivetingly strange. "One has entered a murky Stygian world without personal identity and history," Mc Evilley explains. If you haven't experienced "Zero Mass," Mc Evilley's comments may sound a bit theoretical and dramatic. Having been there, I find them accurate. "A lot of people walk in for a few seconds and then just leave," Max the shadowy security representative explained calmly. I have to admit, it makes sense that walking into a room of "nothing" could frustrate impatient museum goers. It takes a few minutes, and some sensitivity, for Orr's installation become anything other than the darkest room you have ever been in. Metzler went on to mention that he had spent more than 3 hours standing in "Zero Mass" on opening night, and it was clear that he had become completely attuned to the installation's unsettling effect, and quite expert on how it all worked. "If you leave for a few minutes and then come back your night vision still works," he explained. As Metzler and I chatted a bit more I was struck by how bizarre it was to have a friendly conversation with someone who I had never "seen."  He was there in the room, and leaned on what appeared to be a cane, but was utterly flat and featureless. Using a photo I took of Max after leaving the exhibit, I was later able to approximate what I saw when he entered the room. My photoshop simulation is below, followed by the unaltered photo of Max that it was derived from. 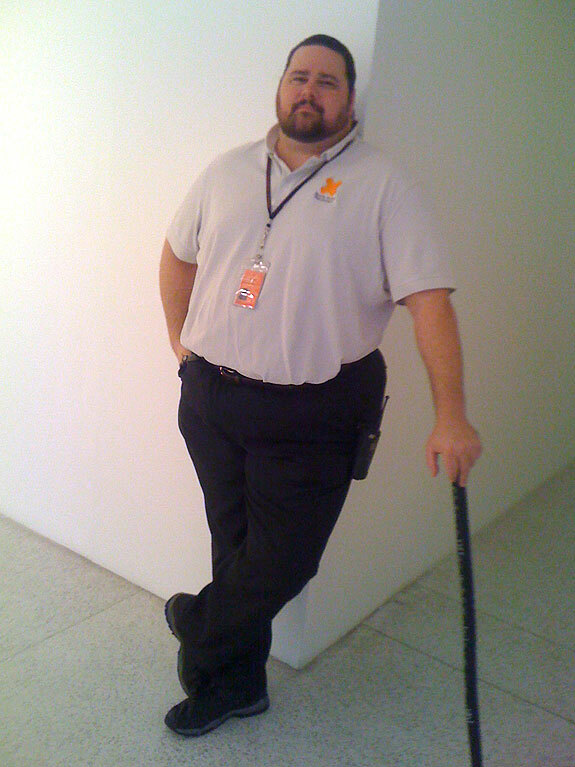 Max Metzler, MCASD Security Services Representative, as he appeared standing inside Eric Orr's "Zero Mass;" Image created in Photoshop by the author. Leaving "Zero Mass" after about a 10 minute visit, the natural light and ocean vistas that rim the west edge of MCASD were richer than ever before. Still, the strangeness of what I had experienced inside Orr's work lingered. An hour later, after I had already started my car to leave, I had to race back inside and ask Max Metzler if I could take his picture. I needed something to ground my imagination a bit, as if what I had experienced just might have been a dream or hallucination. The experience of "Zero Mass" had opened up my visual sensitivity and my imagination. "Life itself does not belong to us," proclaimed the artist Yves Klein in 1959, "it is with sensitivity, which does belong to us, that we are able to purchase it." If you want to challenge your sensitivity, forget everything I have just said about "Zero Mass," drive to La Jolla and walk in. It will provoke your senses, incite your imagination and open you up a bit. And don't worry, if you feel a bit freaked out Max Metzler and other members of MCASD's excellent security staff can talk you through it a bit, if you don't mind chatting with Stygian shadows.